Everyday, hundreds of millions of people use Facebook’s notifications bar to learn more about the important events around them. But they have never really been customizable, i.e. until now. According to the $280 billion company, a major change is coming to them so you can view things important to you with a quick glance. Furthermore, you can also allow access to your location history in order to keep up with the events happening in your locality, weather updates and alerts, movies playing at theaters near you and places to eat (along with their reviews). To get these new cards, you’ll have to tinker a bit under the Settings option. Info can be customized by touching a small arrow near at the corner of these Google Now-style cards. More cards can be added from here, too. With time, more useful and consumer-oriented information will also be added. These personalized settings will be available for Android and iOS initially in the US and make their way worldwide soon. 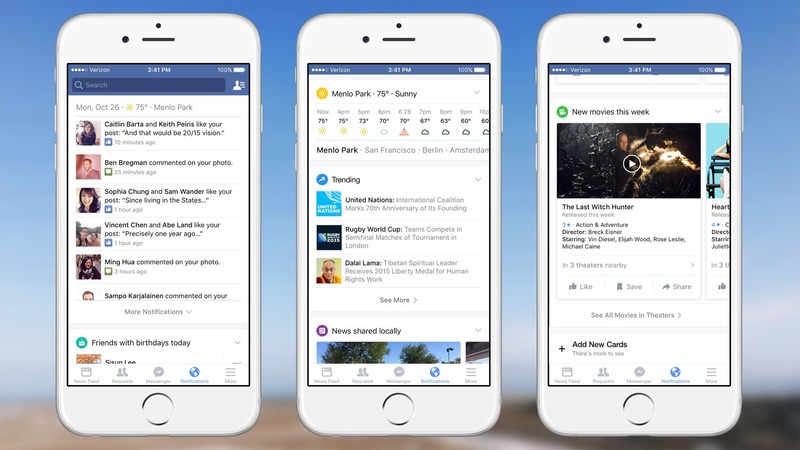 Are you talking about fb notifications or Google now in this post. Didn’t get it. Instead of doing these stuff. They should try to make facebook experience smoother and stop it from draining battery.